This book provides a new interpretation of the Northern Irish Troubles. From internment to urban planning, the hunger strikes to post-conflict tourism, it asserts that concepts of capitalism have been consistently deployed to alleviate and exacerbate violence in the North. Through a detailed analysis of the diverse cultural texts, Legg traces the affective energies produced by capitalism’s persistent attempt to resolve Northern Ireland’s ethnic-national divisions: a process he calls the politics of boredom. Such an approach warrants a reconceptualization of boredom as much as cultural production. In close readings of Derek Mahon’s poetry, the photography of Willie Doherty and the female experience of incarceration, Legg argues that cultural texts can delineate a more democratic – less philosophical – conception of ennui. Critics of the Northern Irish Peace Process have begun to apprehend some of these tensions. But an analysis of the post-conflict condition cannot account for capitalism’s protracted and enervating impact in Northern Ireland. 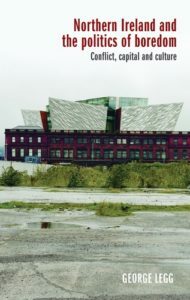 Consequently, Legg returns to the origins of the Troubles and uses influential theories of capital accumulation to examine how a politicised sense of boredom persists throughout, and after, the years of conflict. Like Left critique, Legg’s attention to the politics of boredom interrogates the depleted sense of humanity capitalism can create. What Legg’s approach proposes is as unsettling as it is radically new. By attending to Northern Ireland’s long-standing experience of ennui, this book ultimately isolates boredom as a source of optimism as well as a means of oppression.